There’s nothing quite like the beauty of a Rajputi dress for a woman to beautify herself. The Rajputi Poshak is very comfortable woman attire. Nowadays every woman wear-out the Rajputi poshak because this is a very splendid attire for women. A rajputi dress is generally known as a Rajputi poshak is a dress worn by the women in Rajput families. Today, there are a collection of designs for Rajputi poshak’s. A Rajputi poshak is a beautiful attire that is a subtle blend of Mughal and Rajasthani textile culture. The art and fashion of wearing the separate pieces of this dress have prevailed the same for quite some years. Rajputi poshak’s indicates the personal of the women brilliantly. Rajputi poshak’s are available in a plethora of designs and vibrant colors. 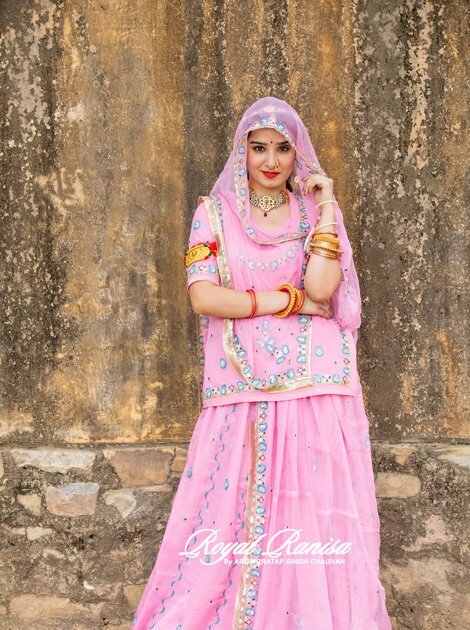 Royal Ranisa provides the different color of the Rajputi Dresses in Jaipur such as Red, pink, orange, yellow and green are some classic colors in which Rajputi poshak’s are designed for women. A Rajputi poshak or a Rajputi dress is an attire made of 4 unique pieces of garments in gorgeous patterns, attractive embroidery, dazzling ornamentation of stones and beads and dyed in bright and vivid colors. A Rajputi poshak will never fail to capture your attention because a woman exhibiting this dress reflects elegance and grace in the purest of its forms. Much famed in Rajasthan and Jaipur is the trade of Rajputi dresses. Rajputi dress trade is also seen to have a great online presence where people indulge in a classic online shopping experience for these dresses. Today, Rajputi poshak’s are not plain limited to Jaipur or Rajasthan, but they have found love in women hailing from different states of our country and even beyond. Rajputi poshak’s are designed artistically to render sophistication to the attire as these are often adorned by women on festive occasions, religious ceremonies, weddings, and parties. A Rajputi poshak guarantees absolute comfort and does not weight down the attire with the ornamentation and embroidery work. When adorned with complimenting jewelry, the Rajputi poshak creates a wonderful aura and appearance in itself for the women. The kanchali, kurti, ghagra, and odhani are the essential individual garments that make up the whole Rajputi dress which is super comfortable to drape and carry as opposed to their heavy and jazzy appearance. When embroidering work and embellishments, gotta Patti and fabric coarseness get too much. In addition to above, the designers essentially create the Rajputi poshak with an inner lining of astar to add comfort and softness to the attire. Cultural festivals and occasions are the days when Rajputi women parade in grace and style in the lovely Rajputi poshaks. Many Rajputi women also adorn the dress in for their daily wear and routine life. Rajputi dresses for an everyday purpose are simpler in comparison to the traditionally designed ones. However, every day wear Rajputi poshak is also dyed in bright colors and bear light gotta Patti work. Embroider heavy attires are usually worn on festivals such as Teej, Gangour etc. You can easily purchase Rajputi dresses online and women can look through a lot of designs before making a final purchase. 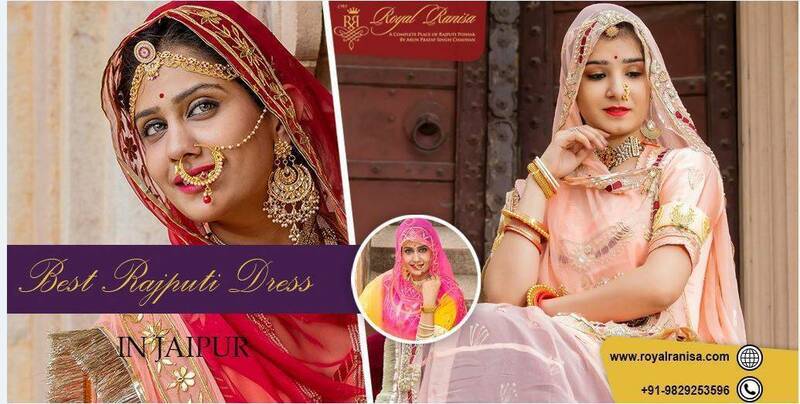 Royal Ranisa provides the best Collection of Rajputi dresses in Jaipur at an affordable price. 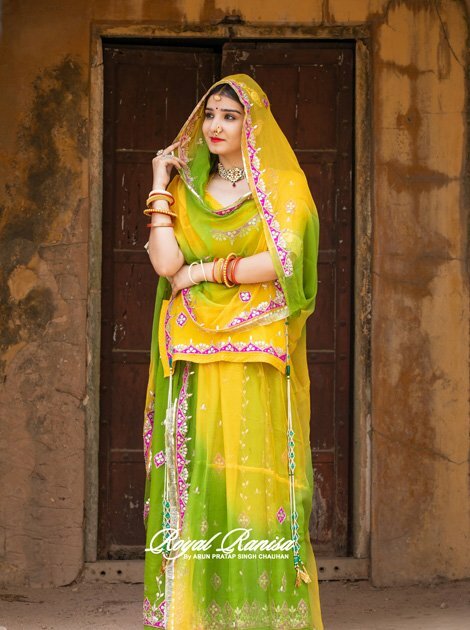 A rajputi dress is generally known as a Rajputi poshak is a dress worn by the women in Rajput families.